Khirbet Cana is one of the most likely candidates for the site of Jesus's first miracle, turning water to wine. Although the traditional place is in the modern village of Kefar Kenna, closer (6KM, 3.7 miles) to Nazareth, there are other scholars that favour this featured site. The photo is from Khirbet Cana, with a view towards the east. 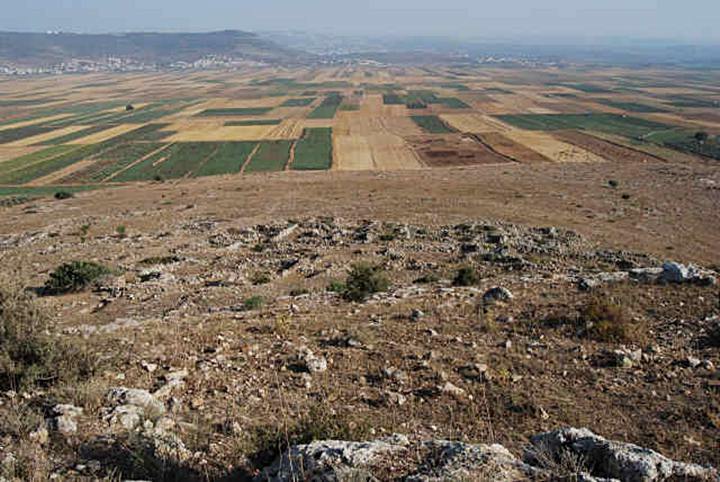 The fields of the valley of Netufa is seen in the near background, and Nazareth is located on the far right hills. On the hillside above the valley are ruins of the Byzantine period houses, while the Hellenistic and Roman period ruins, from the times of Jesus, are on the top of the hill - where the photo was taken. Click here to see more about this site. John 2: 1-11: "And the third day there was a marriage in Cana of Galilee; and the mother of Jesus was there: And both Jesus was called, and his disciples, to the marriage. And when they wanted wine, the mother of Jesus saith unto him, They have no wine. Jesus saith unto her, Woman, what have I to do with thee? mine hour is not yet come. His mother saith unto the servants, Whatsoever he saith unto you, do it. And there were set there six waterpots of stone, after the manner of the purifying of the Jews, containing two or three firkins apiece. Jesus saith unto them, Fill the waterpots with water. And they filled them up to the brim. And he saith unto them, Draw out now, and bear unto the governor of the feast. And they bare it. When the ruler of the feast had tasted the water that was made wine, and knew not whence it was: (but the servants which drew the water knew;) the governor of the feast called the bridegroom, And saith unto him, Every man at the beginning doth set forth good wine; and when men have well drunk, then that which is worse: but thou hast kept the good wine until now. This beginning of miracles did Jesus in Cana of Galilee, and manifested forth his glory; and his disciples believed on him. ".